1. The Assembly considers that judicial and parliamentary scrutiny of government and its agents is of vital importance for the rule of law and democracy. This also applies especially to so-called special services who’s activities are usually kept secret. Security and intelligence services, the need for which cannot be put into doubt, must nonetheless not become a “state within the state”, exempted from accountability for their actions. Such lack of accountability leads to a dangerous culture of impunity, which undermines the very foundations of democratic institutions. 2. In combating terrorism, governments are increasingly invoking “state secrecy” or “national security” in order to ward off parliamentary or judicial scrutiny of their actions. 3. In some countries, in particular the United States, the notion of state secrecy is used to shield agents of the executive from prosecution for serious criminal offences such as abduction and torture, or to stop victims from suing for compensation. The United States also refused to co-operate, in particular, with the judicial authorities of Germany, Lithuania and Poland in the criminal investigations launched in those countries in view of numerous elements of proof of abductions, secret detentions and illegal transfers of detainees (see Resolution 1507 and Recommendation 1754 (2006) and Resolution 1562 and Recommendation 1801 (2007) of the Assembly). 4. The Assembly recognises the need for states to ensure effective protection of secrets affecting national security. But it considers that information concerning the responsibility of state agents who have committed serious human rights violations, such as murder, enforced disappearance, torture or abduction, should not be subject to secrecy provisions. Such information should not be shielded from judicial or parliamentary scrutiny under the guise of “state secrecy”. 5. The Assembly believes that there is no reason why judicial and parliamentary institutions should be less trusted than state executive bodies and their agents where the protection of legitimate secrets is concerned. As Canada demonstrated in the Maher Arar case, it is possible to put in place special procedures for the supervision of the activities of the special services guaranteeing both the adequate protection of legitimate state secrets and the protection of fundamental rights and freedoms. 6. 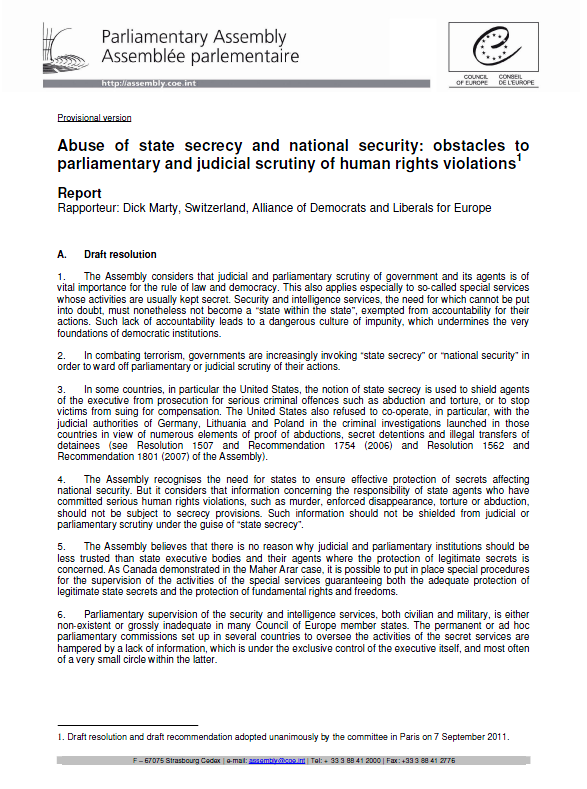 Parliamentary supervision of the security and intelligence services, both civilian and military, is either non-existent or grossly inadequate in many Council of Europe member states. The permanent or ad hoc parliamentary commissions set up in several countries to oversee the activities of the secret services are hampered by a lack of information, which is under the exclusive control of the executive itself, and most often of a very small circle within the latter. 7. The Assembly welcomes the growing co-operation between different countries’ secret services, which constitutes an indispensible tool to confront the worst forms of organised crime and terrorism. This international co-operation should, however, be accompanied by equivalent co-operation between oversight bodies. It is unacceptable that activities affecting several countries should escape scrutiny because the services concerned in each country invoke the need to protect future co-operation with their foreign partners to justify the refusal to inform their respective oversight bodies. 8. The media play a vital role in the functioning of democratic institutions, in particular by investigating and publicly denouncing unlawful acts committed by state agents, including members of the secret services. They rely heavily on the co-operation of “whistleblowers” within the services of the State. The Assembly reiterates its calls for adequate protection for journalists and their sources (Recommendation 1950 (2011) and for “whistleblowers” (Resolution 1729 and Recommendation 1916 (2010)) . 9. The Assembly can only welcome the publication, in particular via the “Wikileaks” site, of numerous diplomatic reports confirming the truth of the allegations of secret detentions and illegal transfers of detainees published by the Assembly in 2006 and 2007. It is essential that such disclosures are made in such a way as to respect the personal safety of informers, human intelligence sources and secret service personnel. The appearances of such websites is also the consequence of insufficient information made available and a worrying lack of transparence of Governments. 10. In some circumstances, in particular in the framework of the fight against terrorism, measures restricting freedom and violating fundamental rights are taken against suspect individuals who are not even informed of the – “secret” – grounds for suspicion on which these measures are based and do not have the possibility to seize an independent complaints mechanism. The Assembly reiterates its appeal in Resolution 1597 (2008) to the competent United Nations and European Union bodies to reform the “blacklisting” procedures, putting an end to such arbitrary methods and putting into place mechanisms that are both effective and respectful of the rule of law in order to neutralise persons suspected of supporting terrorism. European and German inquiries on this subject. 13.3. an adversarial procedure before a body allowed unrestricted access to all information to decide, in the context of a judicial or parliamentary review procedure, on whether or not to publish information which the government wishes to remain confidential. 14. With regard to international co-operation between oversight bodies, the Assembly calls on parliaments participating in the development of the future “Network of European expertise relating to parliamentary oversight of security and intelligence services” to consider widening the terms of reference of the future network and the range of participants in order to make it an effective instrument of co-operation between the competent bodies of all Council of Europe member and observer states, making it possible to remedy the shortcomings in parliamentary oversight resulting from increased international co-operation between the services in question. 50. Finally, the fundamental role played by whistleblowers must not be forgotten. Their importance of their contribution is in fact proportionate to the extent that secrecy is still imposed. It is not exaggerated that, still today – and in some cases even more so than in the past – we are confronted with a real cult of secrecy; secrecy as an instrument of power, as Hannah Arendt reminds us in the citation at the very beginning of this report. It is therefore justified to say that whistleblowers play a key role in a democratic society and that they contribute to making up the existing deficit of transparency. We said so before: the Assembly’s reports of 2006 and 2007 and, more recently, the revelations concerning “black sites” in Lithuania are due to a large extent to honest officials who, for ethical reasons and taking great risks, could not and would not take part any longer in illegal activities or cover them up by remaining silent. In this connection, we should also remember Bradley Manning, the young American soldier accused of providing Wikileaks with a large number of confidential documents. High-ranking American officials and numerous voices of international public opinion have expressed indignation at the inhuman and degrading treatment which Mr Manning is said to have undergone. It will be up to the courts to judge. But we cannot ignore that according to the very accusations made against him we are indebted to him for the publication both of a recording of a helicopter attack in Iraq, in which the crew seems to have intentionally targeted and killed civilians. The video recording seemingly indicates a deliberate criminal act which deserves at least an investigation, which, without this indiscretion, would have never been requested. This is a classic example of an illegitimate secret. In addition, the publication of a large number of embassy reports has allowed us to learn significant details of important recent events and which are obviously of general interest. We must not forget either that these publications have brought numerous confirmations of findings included in the Assembly’s reports of 2006 and 2007 on the CIA flights and secret prisons. All those who at the time called for “proof, proof!” have in any case been well served.